Seth Schwartz’s "The Ancient Jews from Alexander to Muhammad" might appear to be merely a survey of the whos, whats, and whens of Jewish history from 333 BCE to 638 CE. But wait—there’s more! While discussing current consenses on historical issues, Schwartz also gives a helpful primer on the historiography of the period: the lenses and frames with which scholars approach the rough terrain of this historical landscape. 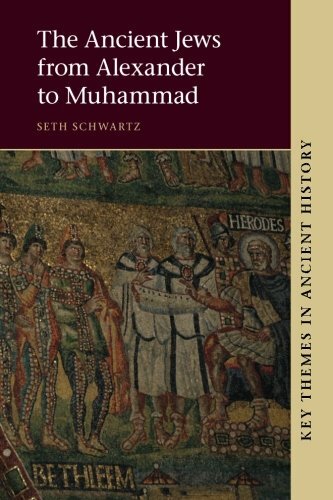 Seth Schwartz’s The Ancient Jews from Alexander to Muhammad might appear to be merely a survey of the whos, whats, and whens of Jewish history from 333 BCE to 638 CE. But wait—there’s more! While discussing current consenses on historical issues, Schwartz also gives a helpful primer on the historiography of the period: the lenses and frames with which scholars approach the rough terrain of this historical landscape. The mere phrase “Jewish history” sparks several questions. To what extent can the Jews be studied apart from their broader cultural environs? In most periods, the Jews are a distinct people; but the historian who omits the ways in which they creatively appropriated surrounding cultures misses much indeed. From this question arises another: what is the relationship between Jewish history and Jewish cultural memory? Philo and Josephus loom large in any account of Hellenistic Judaism, yet their names are seldom heard in today’s synagogues. Finally, where does the balance lie between continuity and rupture in Jewish history? Has Judaism moved through history essentially unchanged, or would a modern Jew not even recognize her first-century counterpart? These three interrelated questions resurface throughout Schwartz’s survey of the key sources for, characters and events in, and debates about ancient Judaism. Earlier scholarship, he argues, attempted to find an essential core to Judaism. This consensus was upended in the 1960s in favor of one in which “the boundaries of Judaism were not simply porous but ill-defined or even nonexistent” (11). These anti-essentialists, notably Jacob Neusner, built their portrait of ancient Judaism from the bottom up. They focused on the diversity of Judaisms and how different Jews constructed their ethno-religious identity. Schwartz aims to critique them too: Neusner and his ilk may have merely substituted one anachronistic depiction for another. Instead of imposing the stereotype of an unassimilating, distinctively-dressed rabbi on ancient Jews, they may have instead projected a twentieth-century secularly-educated, liberal Jew, little different from his surrounding culture. Schwartz tries to chart a middle way between these two extremes. Yes, Judaism has changed over time, often in drastic ways. But the fact that there are still Jews to do Jewish history indicates that Jews have kept continuity and vitality more than other cultural groups. There are no Parthians today doing Parthian history, no Roman Lydians doing Lydian history (153). In contrast to textbook summaries that might project certainty where there is little, Schwartz confesses at times to ignorance of key questions in Jewish history: “for some periods there is no possibility of reconstructing anything like a standard historical narrative” (17). The problem: a lack of sources. Josephus is reliable from the Maccabean Revolt (167 BCE) to the Jewish War (70 CE), but before and after that we have no surviving chronicles of the period Schwartz analyzes. Tragically, one of the most crucial periods in Jewish history—the time immediately after the destruction of the Temple when Jews rebuilt and reconceptualized their religion—is largely unknown apart from scattered sources such as the Bar-Kochba letters, a few fragments in Roman histories, minimal archaeological data, and suspiciously anachronizing later rabbinic texts. Indeed, the period from 135 CE (the end of the Jewish revolts) to the early medieval rabbinic enterprise continues to be a fulcrum of debate in Jewish history: When and how did the rabbis develop? Were they tied to any one of the Jewish sects mentioned in Josephus and the New Testament, and if so, which one? How much authority—intellectual and/or judicial—did the rabbis hold in those early centuries? Here the rabbis’ own narrative of continuity clashes with that of historians such as Neusner and Schwartz himself, in his earlier Imperialism and Jewish Society, 200 BCE–640 CE (2001). Schwartz deems the rabbinic self-narrative “maximalist,” that “almost immediately after 70 the rabbis replaced priests and their kind as the Jews’ religious authorities” (99). He places himself in the minimalist camp, which questions any rapid emergence of a strongly normative rabbinic establishment. Although the rabbis’ own texts are the main source of knowledge about late antique and early medieval Judaism, we must read between the lines carefully. Schwartz’s coverage of this debate exemplifies his skillful interweaving of history and historiography. This book is published in Cambridge University Press’s Key Themes in Ancient History series, which mainly produces works introducing areas of scholarship on the Greco-Roman world. Indeed, one of the key stated aims of Schwartz’s book is to bring scholarship on ancient Judaism into the hands of classicists and ancient historians. At this task, he succeeds. If there is any criticism of this book, it is the short shrift given to Judaism in the early Islamic milieu. More recent research on the origins of Islam in relation to Judaism and Christianity, such as Fred Donner’s Muhammad and the Believers, has illuminated what can be known from Syriac Christian literature, the Qur’an, and later Islamic narratives of the early ummah about the Jews of Mesopotamia, Syria, and Arabia. Although such work lies at the fringe of Schwartz’s chronological boundary, it might have divulged interesting insights into the boundaries of religious communities and their construction. Even so, a sin of omission is hardly a mortal sin. The Ancient Jews from Alexander to Muhammad is a superb and brief, if dense, introduction to how to think about ancient Jewish history. It is written at a level appropriate only for advanced undergraduates or higher. I enjoyed how Schwartz tips his hand to the reader to show a behind-the-scenes take on how Jewish history is done, not just what its current consenses are. Jonathan is a graduate student studying the conversations between Abrahamic Scriptures at the Graduate Theological Union. Previously, he earned a BA in Classics and Religious Studies, for which he wrote a thesis on ancient Greek and Buddhist art. Schwartz, Seth. "The Ancient Jews from Alexander to Muhammad." Ancient History Encyclopedia. Last modified August 25, 2017. https://www.ancient.eu/review/170/. Schwartz, Seth. "The Ancient Jews from Alexander to Muhammad." Ancient History Encyclopedia. Ancient History Encyclopedia, 25 Aug 2017. Web. 20 Apr 2019.